Rangda is the dream team of psych, bringing together three titans, each with equally impressive credentials: Sir Richard Bishop, guitar (Sun City Girls, Brothers Unconnected); Ben Chasny, guitar (Six Organs of Admittance, Comets on Fire, 200 Years, New Bums); and Chris Corsano, drums (Flaherty-Corsano Duo, Flower-Corsano Duo, Thurston Moore, Sunburned Hand of the Man, and the list goes on indefinitely from there). Each is independently responsible for his own staggering discography and so their team-up conjures lofty expectations. Perhaps unsurprisingly, Rangda is more than the sum of its parts. Performing live, each member inhabits his own third of the stage, hardly looking up from his instrument; and yet there is a communion among them that is unseen, intangible—it’s spooky action at a distance. These live renditions are largely faithful to their studio counterparts, oscillating between wild frenzy and repetitive motifs drawn from eastern psych ragas. Bishop’s and Chasny’s guitars rage and duel, Corsano’s drums provide context and setting for that drama to unfold. We caught up with Rangda playing an early Friday evening set at Baby’s All Right as part of a two-date jaunt to coincide with recording a new album. Here, they play songs from both proper Rangda albums, False Flag and Formerly Extinct, and add a longer song that’s either brand new or a modified take on “Gracilaria,” which appeared on a split 12″ with The Dead C. From False Flag, they do “Bull Lore” and the longform set-closer “Plain of Jars,” which builds to a noisy catharsis before resolving into a rhythmic, repetitive guitar jam. “Majnun” and “Night Porter,” both off Formerly Extinct, come off as riffs on some of Sun City Girls’ more accessible, song-oriented material. We unfortunately weren’t able to get a feed from the room mics, but luckily the stereo house feed from Baby’s FOH Rubes is more than adequate. The sound is outstanding and allows you to hear each guitar in its own channel (that’s Chasny left, Bishop right), just as it sounded in the room. This one sounds great on headphones. Enjoy! While there are no further Rangda dates scheduled for now, each have upcoming solo dates and/or releases. Chasny’s new record as Six Organs of Admittance, Hexadic, is out February 27 on Drag City and a tour in support of it is scheduled. Bishop’s new record, Tangier Sessions, is also due out February 27, and is also on Drag City. 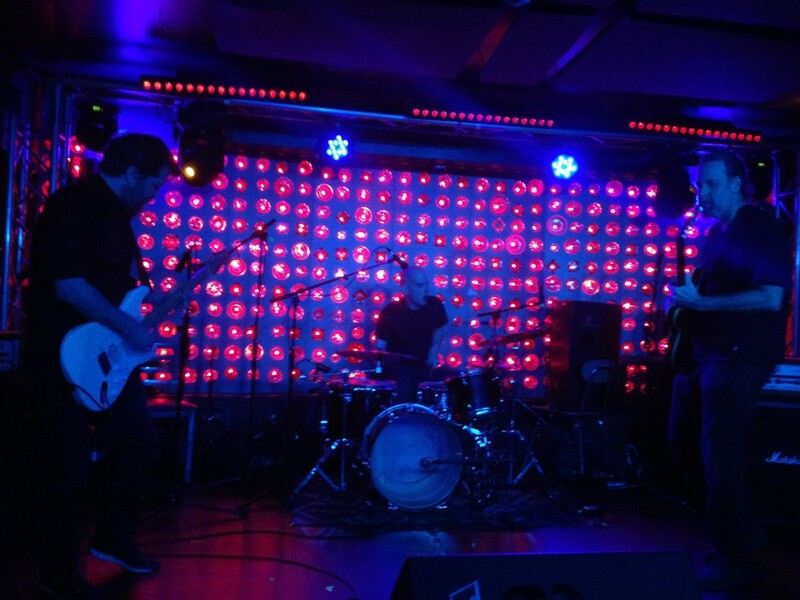 Corsano has a host of upcoming dates, with Ava Mendoza, Joe McPhee, and others. If you enjoyed this recording, PLEASE SUPPORT Rangda. Buy False Flag and Formerly Extinct from Drag City. Thank you! We were lucky enough to catch Rangda the next night up here in lil ole Florence MA. Dynamite show at a relatively new venue, The 13th Floor Music Lounge. Got to chat briefly with Chasny too, nice guy with some mad guitar skills. Links are still good. Hightail has had some hiccups today, but all seems to be ok now.